Big or small, we serve all. At Thermal Air, we are passionate about providing quality comfort with integrity. We believe in maintaining the highest level of customer satisfaction possible, which is why we strive for excellence without exception. Regardless of the size of the job or what it entails, we will show up ready to provide you with professional, efficient, and affordable service. You should know how your system works, how to get the most out of it, and what savings can benefit you. This is why it is our ultimate goal to provide our customers with the education to make informed decisions regarding the system they need. Exceeded my expectations, saved me money, and helped me navigate the latest HVAC technology. The best deal for the high standard we were looking for. Thanks for keeping our loved ones warm this winter! View images of our current and completed projects. 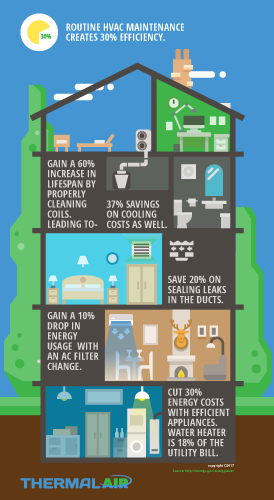 Why is maintaining your HVAC system so important? You want to get the most out of your HVAC system. The best way to do that is through regular maintenance and tune-ups. Just like your vehicle needs regular oil changes and tune-ups, your HVAC system does too. Not only will regular maintenance extend the life of your system, it will lower your energy bill by ensuring efficiency and help the people in your home or business be healthier through regular filter changes.